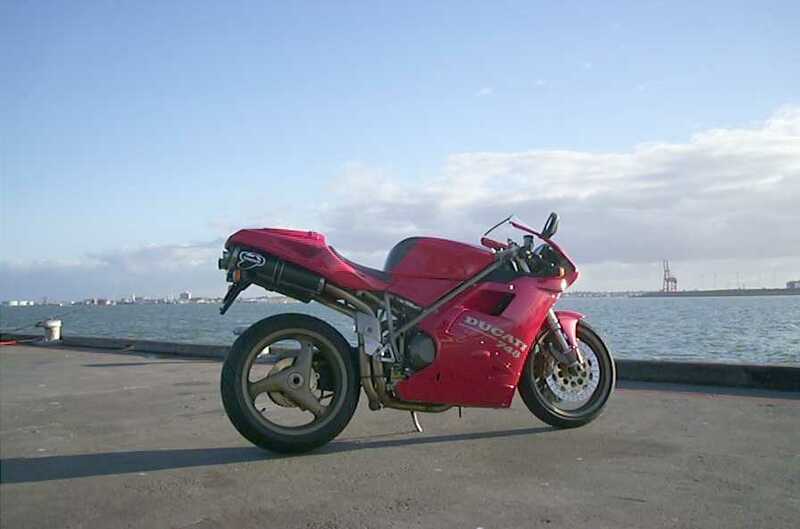 Pix & details of my Ducati 748 Bi-Posto Strada , 1997 model. Braking late for the apex of a tight corner, heeled over with the knee grazing the tarmac, and accelerating hard before the next corner. The rider and machine are like an athletic ballet dancer, dancing to the tune of a growling desmodromic symphony as the engine revs hard to the redline. On a Ducati, the rider merges with the motorcycle to become one, and the sensual experience is unequalled. (Ian Falloon). Engine: 748cc, liquid cooled, 90degree V twin. Fuel system: Weber-Marelli fuel injection, single injector per clinder. Transmission: 6 speed, chain final drive. Front: 43mm Showa inverted fork, 120mm stroke. Oil 8wt, 480cc in each leg. Std settings: Comp 12 clicks, rebound 10 clicks & preload 3rd notch from top. Rear: Showa rising rate mono-shock. 71 mm travel. Std settings: Comp 1 turn out, Rebound 1 turn out. Brakes: Front; 2 x 320mm disc, 4-piston caliper. Rear; 220mm disc, 2 piston caliper. Tyres: Front; Pirelli Dragon EVO MTR21 120/60. Rear; Pirelli Dragon EVO MTR22 180/55. Rake/trail: 23-24 deg/ 91-97mm (adjustable steering angle). Fuel Capacity: 17litres, Res 4 litres. Range 266.9kms (average) until reserve. Reserve range 62.8kms max. Claimed hp: 98 (72 kW) @ 11,000rpm (std). Sprocket ratio/ final drive: 14/38. Drive chain: 520, 94 links. Avg Consumption: 15.7 kms per litre (measured). Pre load: 5th notch from top. Preload: 40mm sag from static, with rider weighing 76kgs. Air filter elements: $20.66 (ea) x2. Final drive kit (front 14, rear 38, Regina chain) $495.00. Tsubaki Alpha Gold Chain (O-ring 520)$195.00. Replacement Voltage regulator on pre-1999 748/9XX. My Voltage Regulator when to God on the 22nd Sept 2002, after doing about 20,000kms on my 1997 748 BiP. Replacement was an ungrade to a different - japanise unit - run on 748/99X bikes after 1999. There is a certain amount of rewiring required due to the difference in connectors. Cost was $570.00 AUS which included the labour charge. Shot taken @ Station Pier, Pt Melbourne. Midday on a clear Melbourne winter day. There are quite a few stories out there within motorcycle community circulating about Ducati reliability & the problems encountered by their owners. 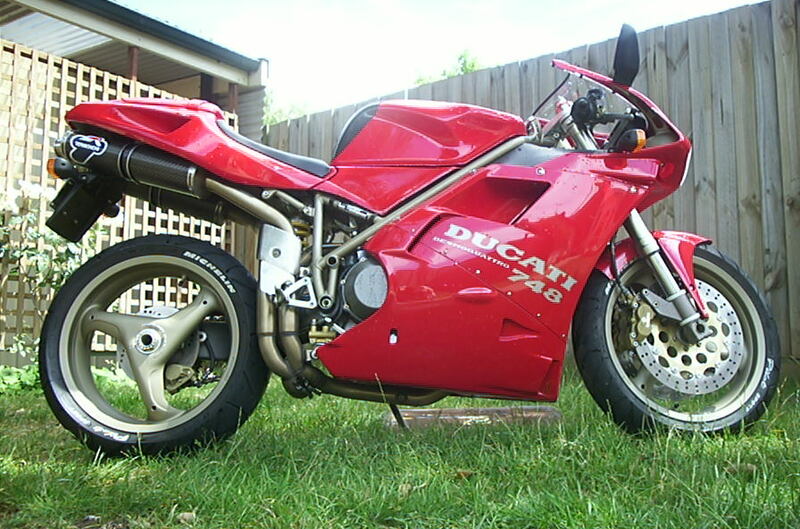 I dont want to paint a grim picture of owning a Ducati as there are just as many horror stories on other makes as well, but I thought it would be better to cover all perspectives to owning a Ducati 748. Below is a few of the worst stories I have heard in relation to Ducati 748/916 problems. I cant really say how common they are, but there have been one that I have personally come across on my 748. Voltage regulator problem. Earlier Ducati 748/916 had problems with the voltage regulator failing causing loss in the charging system, leaving the bike to run off its battery in a "total-loss" system. This can be diagnosed by running a voltmeter across the battery terminals & revving the bike to 4000rpm, you should get 13-14volts, anything below 12volts indicates that the system isnt charging & a faulty voltage regulator may be the culprit. In Australia, a replacement unit for the earlier 748/916 (pre-1999) will involve a slight rewiring due to the current, more reliable, japanise unit having different connectors. In Aust you'll be looking at about $570.00 to fix the problem. Recall on rear swingarm. There had been a recall on earlier Ducati 748/916/996 rear swingarms. The problem stemmed from owners/servicers overtightening the pinch bolts at the rear of the swingarm when doing chain adjustments (the rear axel runs off-centre through "drum" which can be rotated to adjust the distance from the counter-shaft sprocket). Over-tightening can cause stress fractures around the pinch-bolt holes on the swingarm, or these can fatigue during use. Later models are OK & I understand that the recall was purely a cautionary move. Cam Belts. This would generally apply to any motorcycle running cam belts, but for some reason Ducati 748/916 etc the cam belts have to be monitored closely. Replace every 20,000kms (moderate/spirited road use) or 2 years (increase frequency if heavy road & track work is common). The risk of them failing would obiliterate the engine. There seems to be 2 types of cam belts available, those running white labels on the belt (run on most factory originals) & the red labels which are recommended (which are some kevlar compound in them I think). If in doubt replace them anyway. Cost is about $90AUD (each approx). Desmo valve system. This is all hear-say (I have not witnessed cases of this), but some people out there have told me that the Desmo valve system actually runs close to its threshold limits at peak rpm on 748 & 998R etc. These engines produce a healthy delivery of power right up through the rev range, but the sudden (some feel severe) cut-in of the rev limiter may have been a measure taken to avoid excessive stresses at higher revs. After hearing this I have tried to limit "over-rev" with my 748 (which isnt easy on a race track with ya mates breathing down your back, or from someone used to in-line 4s). Also there have been instances of the "chrome facing" on the rockers to wear excessively (this is the plating on the contact surface of the rocker to the camshaft), although Ducati 916 1995 maybe OK. This has been an issue that Ducati has acknowledged as problems with the chrome plating on some models (1996-1998 ?). My 1997 748 has done 18,000kms (July 2002) & I will see what my servicer says when they do the 20,000kms service. Slip-ons (End cans). From new, if you can afford to by a Ducati 748 or 916/998 then you can afford to buy a set on aftermarket slip-ons. One of the most wonderful things about the Ducati Twins that owners & non-owners can appreciate is the sound. This is only enhanced with a good set of Slip-ons. So please, let others enjoy the sound of your baby as much as you do & fit a set of Termi's or equivilent. Of course you'll also have to consider getting the fuel injection system (Black box) Chipped to compensate for the freer flowing exhaust to avoid backfire/flat spots/etc, but settings vary with countries that run different fuels, so see your local Ducati dealer for advise. Rear hugger. The amount of stones kicked up by the rear wheel that hammers the rear shock is amazing! Especially when the tyres heat up, everything not tied down sticks to them & is flung up under the rear guard (A hits the rear shock etc). A rear hugger would definitely help here. Radiator screen.The Ducatis radiator is large, broad & is impacted by just about every stone & bug it comes across. A lot gets kicked up by the front wheel as well, & after a while the assortment of bent rad-fins increases. After-market rad screens available locally here in Aust & no doubt overseas as well is a good investment. Fast, grippy & smooth circuit that is Phillip Island. One hot lap around Phillip Island track. 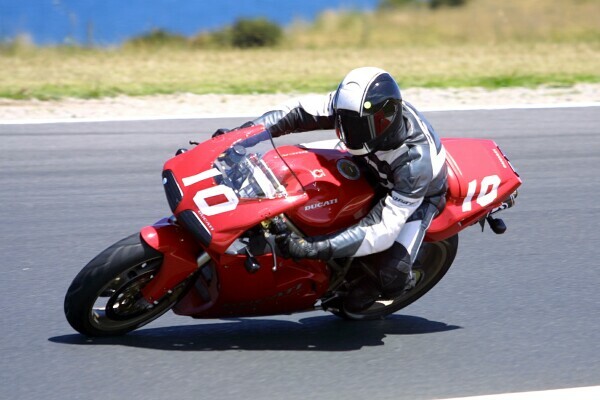 March 2003.Love Phillip Island track. The surface is really grippy in just about any conditions compared to other tracks & that gives great confidence in cornering. Lots of high speed corners, mostly lefts which chews up your tyres on the one side. 2x sharp rights - Honda & MG corner. I'm no racer, on my 748 I clock 230km (indicated) on the main straight before a down change into 5th for Doonah corner - no brake. Southern loop is a strange corner, more like 3x lefts in succession, taking the first 2 mid corner - not running up to the ripple strip - to give you a smooth line out of the last corner. There's a slight left hander just before Honda corner (sharp right) which I do flat out in 4th & 5th (change @ 11,200rpm). Honda corner has a slip lane going straight off it so you can brake as deep as you dare & if you dont make it then you can go straight-on (like Barros did in MotoGP 2002). Then out of Honda corner flat out in 2nd & 3rd into Siberia (sweeping left) holding 3rd gear (about 8,000rpm) & then flat out from Siberia, where there's a slight rise & just about everyone squirms/spins/monos out of this corner into the Hayshed bend - a slight right @ 150kms + - up the rise into Lukey Heights blind left hander , many Boy-racers-for-a-day brake going over this rise (including me sometimes) because you cant see over the edge. Then down deep into MG tight right hander - 60kms. At MG I don't even use my rear brake anymore, the rear is so light into this corner that even downchanging to soon ties the bike into knots & makes you run wide. Out of MG it's difficult to go flat out in 2nd gear as the rear breaks so easily here (3rd is too high), just an easy roll-on with the throttle out of the tight right (MG) & shortshift up to 3rd into the first of the final left sweepers onto the main straight. These last few corners seem to have a thousand different lines when there is a bunch of street bike out there, racer's lines are more definate. When I try to follow them (the racers) through I'm going flat out to the stops in 3rd, 4th changing at 10,500rpm on my 748, the bike runs right up to the ripple strips & its up the slight rise on to the straight. I run 5th gear down the straight & change to 6th under the overhead bridge but I dont seem to increase speed, just changes the engine tone (I run 14/38 - std for Bi-Posto). With the right flow of these last few left sweepers onto the main strraight I have been able to draft & pass larger twins & 900s sometimes (wth riders of similar ability). Last time I adveraged 2min 3 sec, with traffic on each lap. Ducati Owners Clb day Dec 2003. The stand shown in these photos was something I threw together on a rainy day up at my Parents place. It's amazing what you can do with some spare time & cyclone fence pipe. Why a Ducati? Why a 748? 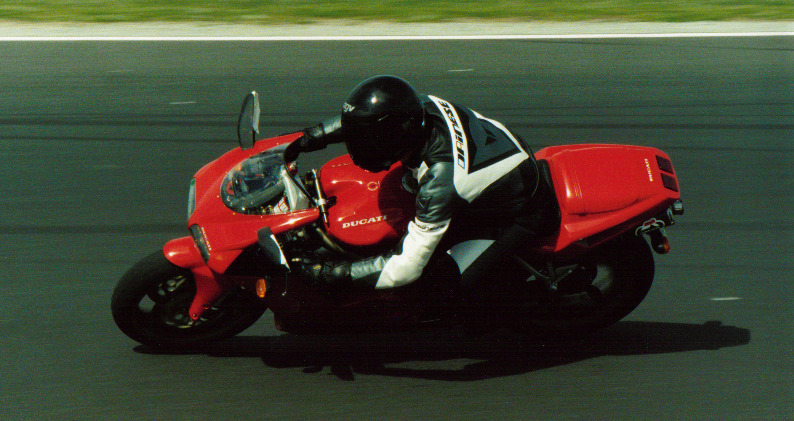 I have been riding motorbikes for a while before the desire came over me to buy the Ducati 748. When the original 916 came out in 1994 (Australia), like a lot of people, I loved the look, the sound & later the track-bred performance raved by the biking community of this bike. Of course at this time the 916 was prohibitively expensive for me & I had resolved myself to admire it from afar as unattainable. Through the mid 90s my interest in off-road at that time gave way to the blacktop when I purchased a Kawasaki Zephyr 750 in 1997. 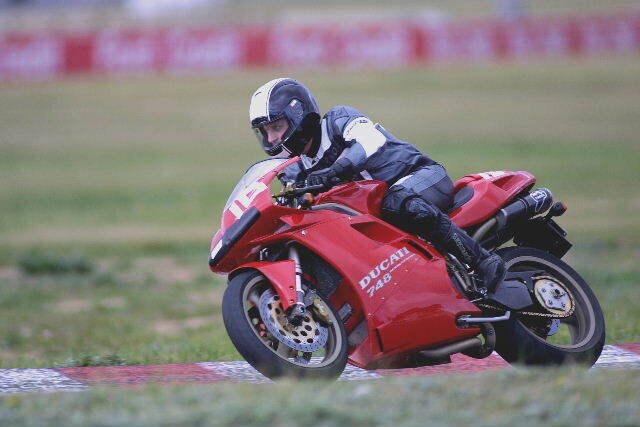 By then Ducati released the 748 alongside their 916 & I liked the idea of a smaller, revvier twin in such a beautiful package, although still expensive in Australia the 748 was retailing for much less than the 916 in what was essentially a similar bike. 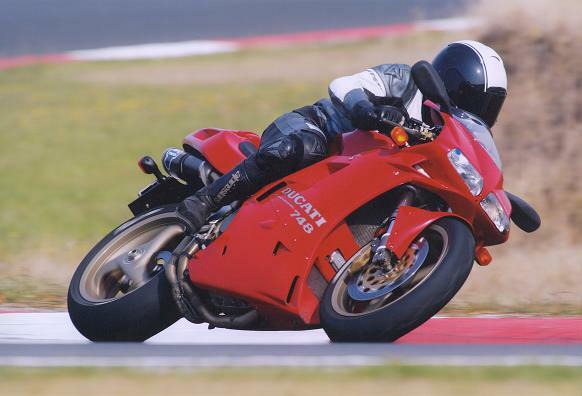 My decision to go for the Ducati 748 came from the exposure to sportier/faster motorbikes & riders (when I went from my Zephyr 750 to a new Honda CBR600 in 1999), and the fact that my riding was becoming more the weekend scratch in the hills or track days than anything else. 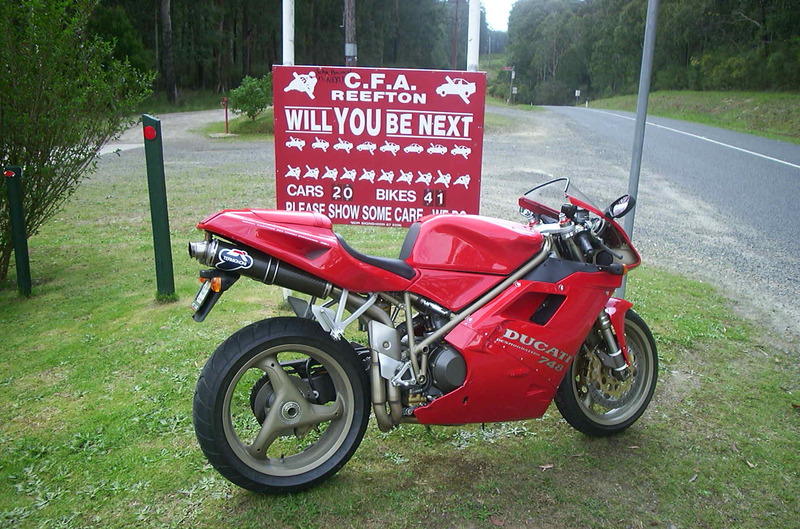 In my time riding road bikes through the 90s I was getting quite a bit of feedback of what owning a Ducati Superbike (748/9XX) would involve from owners themselves. This was beyond the exclusivity & uniqueness that the brand bestowed & went more into the increase cost in parts/servicing & problems of reliability & maintenance. I was under no illusion that owning & riding a Ducati 748 would not be just a simple issue of more $$ = more power/handling etc. Even so the price of 2nd hand 748 were coming down & I had an bloke interested in my Honda CBR600, which made the change a attainable & desirable thing by 2001. Why a 748? Isnt more cc better? My recent past riding road bikes had highlighted to me that power wasnt everything, riding a 600 in-line 4 or a 748 twin wasnt a disadvantage when up against the litre bikes in just about all the applications I was going to put the 748 to. I found that in many cases the smaller cc engine actually made the bike easier to ride faster, where the engine wasnt a factor that could catch you out too much but was there to provide the kind of power-to-the-ground that got show going. Sure its not as lazy as just turning the throttle for that power kick, but the smaller engine is so much more rewarding when you have it wired. I have now owned my 1997 748 Bi-Posto for 2 years & clocked over 29,000kms since I bought it. In this time with drawing from my own personal experiences all I can say is that all the stereo-types & generalisations made about owning an Italian motorbike like the Ducati 748 are essentially correct. Youll find yourself revelling in a wholly new exhilaration of riding motorcycles with the Ducati, but the effort, expense & drama will be there to test your metal. As you can tell by the sign behind the Duke, this must be a fun piece of bitumen. Because it's so close to Melbourne it gets little crowded here on Sunday Afternoons, but it's still a good scratch. The Reefton Spur from Reefton to Lake Mountain/Marysville is pretty tight and one of the few public roads I get my knee down on. On the Duke it's mostly in & out of 2nd & 3rd gear but the Honda CBR600 involved alittle more gearlever input, but still loads of fun. It was even a ball on the Kawasaki Zephyr 750 & KLX650. Styling. 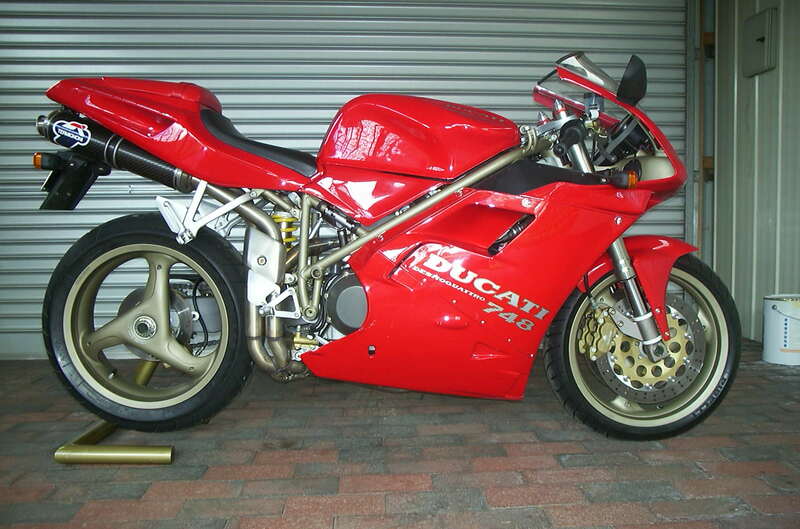 Theres no denying that the 748 (916/998) is one beautiful motorcycle. Its inspired design has still meant that in 2002, 8 years after first being released, it still looks up-to-date & turns heads. Even when this design does date its the sort of bike that will remain as a modern classic. Underseat pipes, single-sided swingarm & compact (narrow), stylish design has set a benchmark in motorcycle architecture. Sound The 748 V twin has such a beautiful sound to it, especally with aftermarket pipes. Together with that intake roar at full throttle/high rpm & the induction pulse from the tank (Its actually doubles as the top of the airbox) makes riding the Ducati a wonderful experience. Even with the plethora of japanise & italian twins around now-a-days, there is that unique Ducati twin sound that can be heard & sets it apart. Engine. Broad spread of power, great balance at high rpm. A lot of twins dont really enjoy being revved as high as this engine but the 748 is balanced right through into the upper reaches of the rev range. The 748 is a good balance between the grunt you get from a V twin configuration & the top end horsepower from the 4-valve competition based engine. The size of 748cc is a very manageable package which is best utilised in many real world situations (public road use, track days).The nice thing about this engine and cam combination is the way the power hangs on once it peaks, just like the combination in a 996SPS. This is very different to the very high peak built into a 748SPS. Handling. The racer geometry & light transition in corners make the 748 a joy on a twisty road. It has a planted - direct - feel with the front wheel, you can virtually feel everything the front tyre is rolling through. Even though the suspension is quite harsh through much of the surfaces you may come across on public roads, although small pot holes or bumps when cornering dont really upset or deflect the front end. Wheelbase may be quite long compared to the current batch of 600cc in-line 4s it still tracks well on tight corners. The suspension is fully adjustable for rebound, compression & pre-load. The steering angle is also adjustable to vary the rake/trail. Steering lock. Lack of turning circle. Without spinning up the rear wheel to square off U-turns you would be left with going from white line to white line on a single lane (either way) carriageway. Riding position. True racer crouch. The clip-ons are well forward & quite low which worsens effort with very low speed manouvrobility & rider comfort on long trips. Seat is very hard. The footpegs are relitively high & rear-set. Fairing doesnt offer a whole lot of coverage. Looking front-on to the 748 the overall bodywork is so small that it looks more like a 250 than a 748/916. Side by side any of its equivalents the Ducati looks tiny. When on board at speed its difficult to get out of the buffeting behind the screen, not surprisingly just about all race-prepped Ducati 748/998 now run higher screens. My 748 Bi-Posto has its fairing held in place by Quick-release Dzud fasterners (10x for both lower fairings to expose the engine). Cost. Aside from the initial purchase price, spare parts are relatively expensive & servicing costs are quite high. Major Service intervals are 10,000kms apart compared to most Japanese bikes which are about 16-20k kms. Appointments. We all realise the quality of components run on Ducatis like the suspension & engine parts, but its the little things like lack of tie-down points & pinion comfort that reflect the comprises in design. Other little annoyances are the mirrors (cant see anything unless you move you elbows/arms), vary little underseat storage & heavy clutch (even though its hydraulic). During the road bikes development stronger crankcases were designed and the engine grew with the 851 (92 x 64 mm) being the first engine released. The valves were unchanged from the prototype and were still designed to fit over an 88mm bore however. As the road bike range got bigger the engines grew in size, first to 888, (with 94mm pistons) then 916cc, by taking the stroke up to 66 mm. Apart from increased valve sizes, the head remained the same. 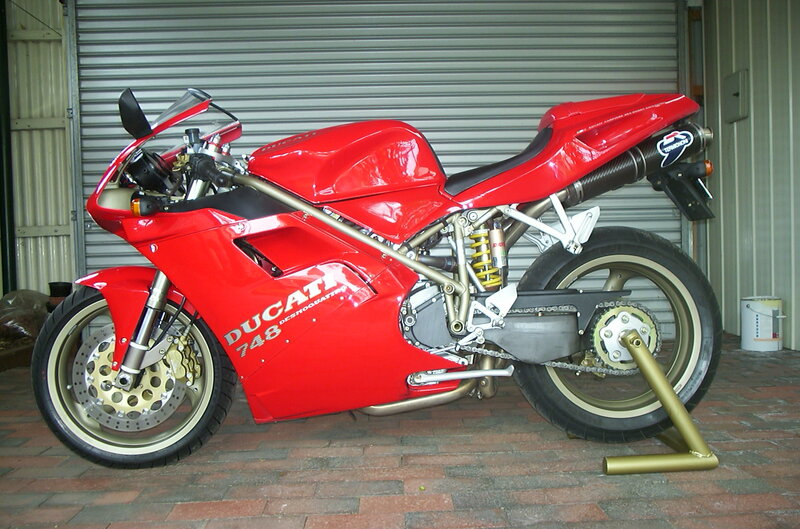 Once the 916 range was established Ducati wanted a smaller sports bike; not as one would expect, just to compete in another capacity category, but also to allow a different experience to the owners, this was to be an engine that thrived on revs, buzzy and radical compared to the 916's tractor like torque. The bike comes with slightly lighter flywheels and a closer ratio gearbox (the same one found in the 996SPS actually). The market dictated that it should be sold for less than a 916, and although it is difficult to find any difference in many engine components of both models I still have not worked out why it is any cheaper to build a 748 than a 916 (or a 996 for that matter) as apart from bore and stroke they are identical (same size valves are in the 748 as the 916). This leaves us in the superb position of having many 748's out on the street that can be best looked upon as shrunken 916's, seriously overbuilt in terms of strength. The 748 range has historically had several different models. The basic is the 748 Biposto, then there was the 748 SP and SPS. Since 2000 the 748R replaced the SPS . The same Biposto engine also comes in the 748 Mono (in the US) and the economy 748S and 748 models. The engine has a wonderful free revving quality and makes superb noises both from under the tank and through the pipes because of the revs. If there is a problem it is that the redline is very near to the long term reliability limit for the desmo system operating the valves. Most street owners do not get any problems, but by the time you have the redline of 11500 rpm being hit really regularly (you will only do this by going flat out on a motorway or blitzing round racetrack) things will need servicing more than every 10,000kms to keep them reliable. There is no internal difference between a 748 and a 916 apart from the bits that are affected by the bore and stroke changes. In a perfect world you would want to keep the revvy, effervescent, nature most owners wanted when they bought the 748, you would also want to give it a bit more grunt out of the corners and allow the usual speeds with a little less stress on the valve gear. If you could do this without any compromise in reliability you would have the best bike Ducati never built. Me & my baby @ Phillip Island.